AKIPRESS.COM - Bat Zuu LLC has created the biggest and king patterned Hun Deel, with a height of 14 meters and a width of 18 meters for two months, engaging over 50 tailors. The aim to set new Guinness World Record, said GoGo Mongolia. 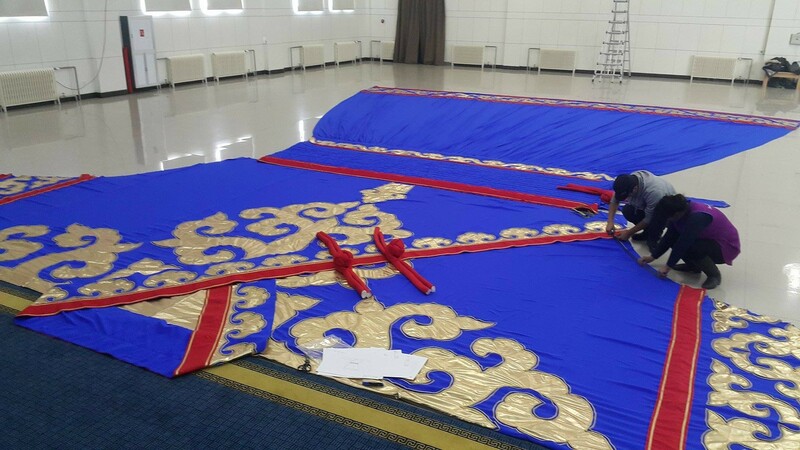 The Hun Deel was made with 0.5 million meters of cotton and used the original design of Hun deel found in Buhan Hoshuu, Khentii aimag, which is now being preserved at the Mongolian National Historical Museum. Advisor of Bat Zuu LLC, J.Oyunchimeg stated that the main force was to create a major work for promotion of Mongolia to the world. "People are not widely aware of Hun Deel being preserved at the Mongolian National Historical Museum as a historical heritage. Thus, we aimed to create its bigger version, enabling people to see the historic, scientific and technical great skills that reflected in that Deel. We hope Mongolians will be proud of their country and wear their traditional costume after seeing our work," Oyunchimeg said. The biggest Hun Deel will be open to public tomorrow at Great Hall of Mongolian National Chamber of Commerce and Industry.